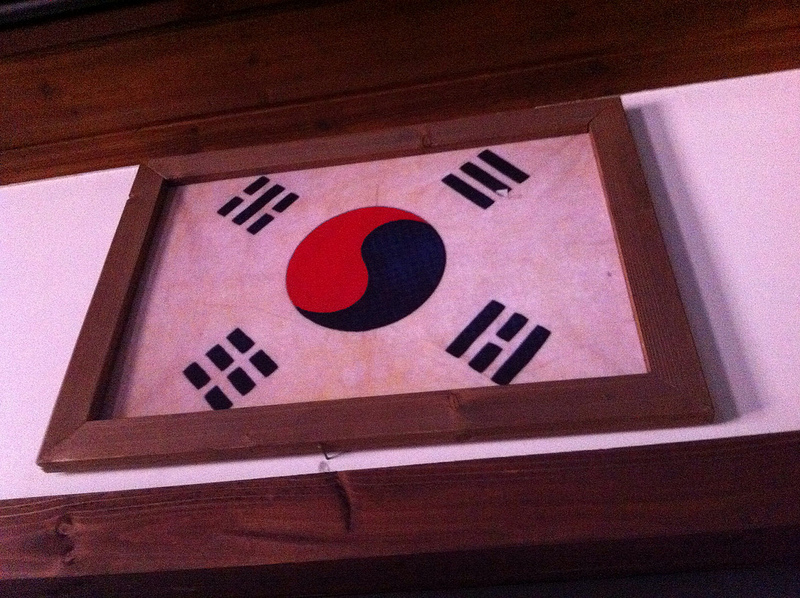 Korean flag from Ewha Girls’ High School, the first girl’s secondary school in Korea. Also, a good litmus test for ethically and culturally appropriate education. I stumbled across the above tweet from @meowtree (aka, Linda Raftree) and was intrigued by a few of the points that John Traxler raised in the comments. John always brings a voice to the ethical side of the equation of ICT research and design. As I wade through the research I am doing for my PhD on mobile technology use in Korean higher education, some of these points in particular struck home. So, this is less adding significantly to the points that John has raised, but rather a reflection on how these points are manifested in my context. Since I believe in reflexivity and try to instill that in my students, I need to practice what I preach here in regards to my own research and development as an academic (however defined). So I will broadly discuss a few of John’s points and relate those to my work in the Korean context. Western Model of University as Exemplar? 1. Have we implicitly assumed that the western/European model of universities is necessarily the sole or best expression of a culture’s or a community’s higher learning and intellectual enquiry and endeavours? I think it carries well beyond an implicit assumption and carries right into explicitness. We have engineered a system in higher education that overtly emphasizes Western epistemological and ontological structures (of questioning and proof) towards Western outputs (academic papers or monographs). Other modes of thinking, questioning, and proving are de-emphasized for not corresponding efficiently to Western outputs, thus regulating much of the Asian philosophical tradition to a subsidiary research subject. Several countries that have accelerated “modernization” and growth in an extremely condensed timeframe (for Korea, since the end of the War in 1953) have adopted many of the Western foundations of development wholesale, higher education included. So, at least in the Korean context, we see higher education with a high emphasis on coursework resembling the Western model and academic output in highly ranked journals (same is true everywhere) with monetary incentives attached to publication in these same journals. I don’t mean merely a publish or perish scenario, but rather being directly paid (significant sums) to be published in an A&HCI, SCI, or SSCI journal. This is done strictly for their effect on bolstering the university’s rankings in primarily US or UK systems (Guardian, QS, etc.). So the underlying philosophy of education in the Korean context (quite rich and nuanced) is unhinged from the mode and outputs of education. 4. As western/European pedagogy, or rather the corporatised, globalised version of it, now deploys powerful and universal digital technologies in the interests of profit-driven business models, should we look at empowering and preserving more local and culturally appropriate forms of understanding, knowing, learning and enquiring? Yes, and yes. I think in the Korean context, this is being done. Traditional Korean educational and philosophical culture (however defined) is in no danger of becoming extinct, despite it being occasionally disconnected from higher education. It is its detachment that concerns me, however. I would love to see a Korean model of higher education that reflects the culturally specific approaches to learning in the Korean context. I would love to see a reorganization of higher education with these approaches as its foundation. I think we need more diverse voices in this discussion of meaning and learning and coming to know rather than a myriad of homogenized systems modeled on one ‘ideal’. So this question is indeed quite valid in the Korean context. I don’t want individual Korean studies departments; I want Korean Studies as the foundation of Korean higher education. What does ethical research design look like in fluid, non-Western contexts? 9. Is the notion of individual one-off informed consent as the basis for research intervention inappropriate in a post-positivist world, inappropriate for collectivist cultures and inappropriate for fluid, complex and abstract systems such as TEL? This one is a bit more specific, but I find myself reflecting on it almost daily on the PhD research I am doing in the Korean context. To begin with, the Korean and Western notion of ethical educational research is different, so much so that I am working on a paper merely discussing those differences. They do not transport themselves across boundaries without losses in translation. So, I have an ethical structure generated through a Western context (drafted and approved by the Institute of Education at the University of London) and being applied in a Korean context (through the universities I am working with). To begin with, many Korean universities, despite having ethical research guidelines, etc. have little to no formal mechanisms for ethical review. I don’t mean these don’t exist at all. I am merely saying that this high-context Korean scenario doesn’t explicitly articulate these in a way that is coherent to a Western audience. So formal requests for ethical review of a particular research study are not necessarily the norm in Korean research culture. It is a more fluid understanding of roles and responsibilities. One has to be extremely careful with asking students to participate in research studies precisely because of the respect afforded the professor, which carries with it an implicit coercion. Students may or may not feel they are required to participate (even if that is overtly stated as not being the case). Merely asking is the ethical handshake; the formal structure of the research design is less important (at least in my experience). Further than that are the appropriateness of the chosen research methods. My experience is that there is, at least in the field of elearning, mobile learning (an almost nonexistent term in Korea), or any sort of technologically assisted learning, quantitative dominates qualitative approaches. So much so that a qualitative approach, by its mere foreignness, will be met with some degree of suspicion from fellow faculty (perhaps due the fuzziness of its outputs) and occasional bewilderment from students and research participants. So narrative interviews, visual research methods (images, media, representations, etc. ), i.e. the bulwark of my approach, is indeed a foreign model, at least as it is expressed in my research design. So I constantly ask myself is this an ethical approach that I am employing? Am I baiting the hook with my research design to get answers that coincide with my research questions? This is ethical research reflexivity as far as I see it. Side note: data collected to date is showing an extremely diverse range of practices well beyond what I originally anticipated. I seriously doubt my ability to get at these practices without these novel (in the Korean context) methods (narrative interview and visual data collection). But I should continuously being reflecting on whether or not they appropriate to the Korean context. Also, the terminology is culturally specific. Korea, at least in the research community, does not use the term mobile learning, but rather focuses on the broader terms of ubiquitous or smart learning. This is done primarily because of government encouragement (in terms of funding) and does not seem to reflect what is happening in other parts of the world, but it remains an ethical consideration. If I want to research mobile learning (both informal and formal) in Korea, I need to do so without framing the discussion around mobile learning itself; rather, I had to contextualize the discussion through activity and practice. Describe your day as a student. Describe your day online. Tell me about your interactions online. It might sound absurd to start that broadly, but I need to establish a context before proceeding to mobile learning. Time consuming (and fatiguing), but I believe it be more ethically and culturally appropriate in the Korean context. In short, thanks John. Got me thinking again.